I really like bread pudding but I don't make it a whole lot due to a lack of stale bread in the kitchen. Usually, when I think to make it, the bread is all fresh and the stores are all closed. Flipping through the December issue of Canadian Living, I came across a recipe for Cranberry Chocolate Croissant Bread Pudding. Wow! It used mini croissants, cranberries and chocolate and I knew I had to make it. 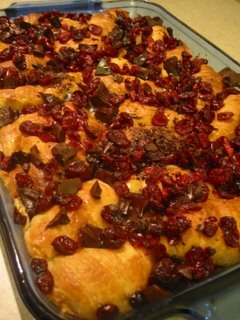 The dessert is assembled by laying split croissants in a baking dish and sprinkling with chopped semisweet chocolate and dried cranberries. Poured over top is a mixture of sugar, whipping cream, milk and eggs. Decadent, I know, but if you have company or neighbours who appreciate baked goods it will all get eaten without you feeling guilty. From the picture it is hard to tell what the texture is like. The croissants are puffed up and when cut it, you could see they were moist and melt-in-the-mouth and they did not taste eggy. (Just make sure the centre is not liquidy.) 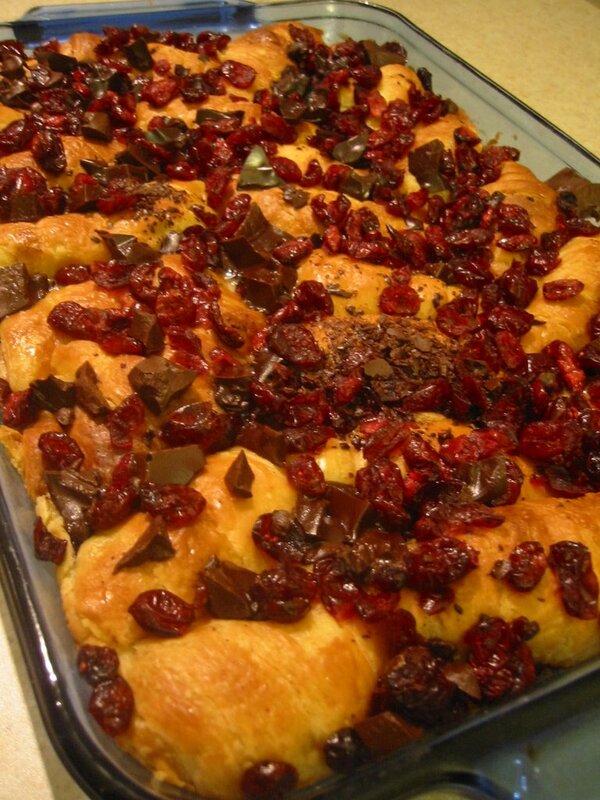 The melted chocolate chunks taste great with the tart chewy cranberries. The toppings looks like a lot but it was just the perfect amount. It was a surprise hit in my house and would make a great brunch dish. Translated into English, bruti ma buoni means "ugly but good". These little Italian meringue cookies are fun to make and even more fun to eat. The method for making these cookies is quite different from drop cookies. The steps aren't hard, but do require some patience as consistency and texture are important in achieving a perfect end result. First, egg whites are whisked with sugar until opaque and then beaten until cool and glossy. The batter looks really beautiful, like liquid satin. Afterwards, some flour and chocolate are folded in and dropped onto cookie sheets to bake for about 25 minutes. When the cookies come out of the oven they look like golden puffs. 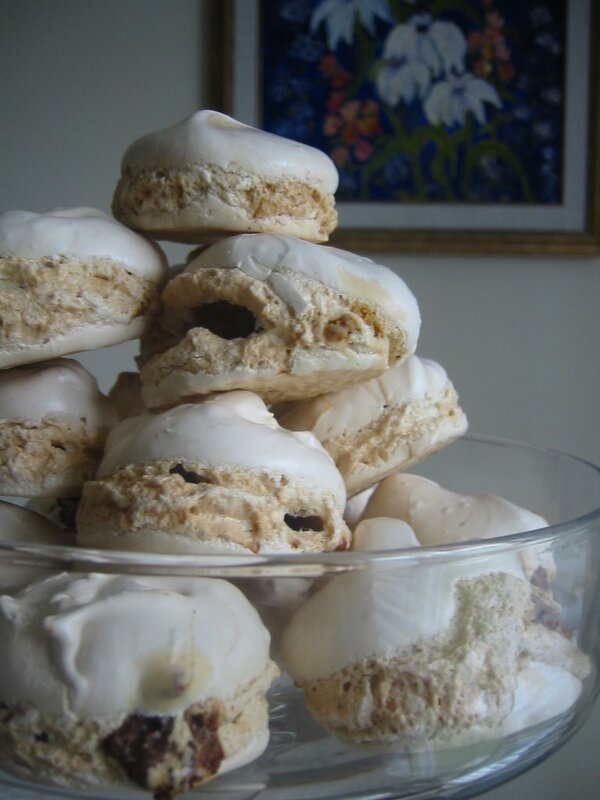 The meringue is crunchy yet soft and the cookies are hollow. They are perfectly sweet and would pair beautifully with a strong espresso or frothy latte. 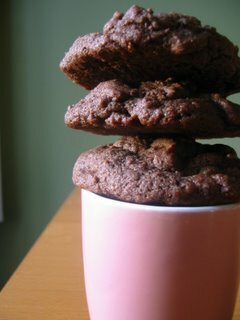 Here's another cookie recipe from the Nestle Best-Loved Cookies cookbook called Double Chocolate Dream Cookies. They are like a regular chocolate chip cookie except that cocoa powder is added to make the dough chocolately brown. I think the key to making this cookie successfully is to use a good quality cocoa powder. There are many choices of unsweetened cocoa powders including Dutch process and natural cocoa powder. Dutch process is treated with an alkali to neutralize its acids. Natural cocoa powder tastes very bitter and gives a deep chocolate flavor to baked goods. Making cocoa powder is a fascinating process. To read more, click here. If you're using natural cocoa powder, reducing the amount called for may make your cookie less bitter. Just read the ingredients and you'll know what you're using. I used Fry's Premium Cocoa for these cookies and looking at the ingredients, sodium carbonate was added. Knowing what type of cocoa you're using can make quite a lot of difference in the finished product. These cookies turned out very well. The cocoa powder gave the cookies a deep chocolatey flavour without the bitterness and the chocolate chips added extra sweetness. They were soft and chewy and were much appreciated by the friends I got to share them with. I'm always looking for good chocolate chip cookie recipes. They're so popular and finding a good recipe sometimes seems more daunting than it should. Unfortunately, I don't have a 'Grandma's Secret Recipe' that I can always fall back on (I wish I did) so I resort to cookbooks. I've made cookies that were too flat or too cakey. Sure, they're edible but not fantastic. When I was in Chapters the other day, I picked up a Nestle Favourite Cookies cookbook. It was the small soft-cover type of cookbook that they sell alongside the magazines. I said why not - I can always use another cookie book. 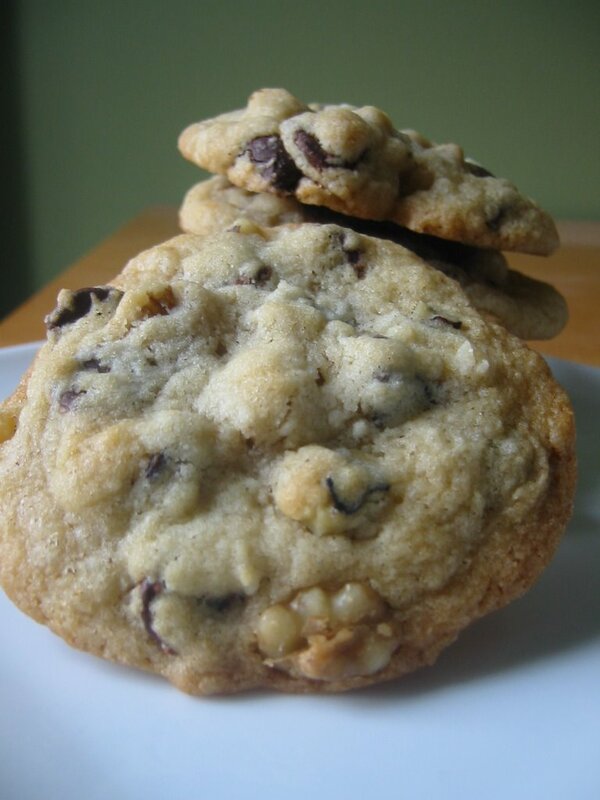 The very first recipe is for their famous Toll House chocolate chip cookie. I tried it immediately hoping it would satisfy my cookie craving. Well, the dough was beautiful. It was like the chunks you find in cookie dough ice cream. I used golden sugar instead of brown so my dough was a little lighter in colour. After a little mixing, they went in the oven and came out all soft and chewy. I was pretty happy since they spread nicely and were not too flat nor too domed. As usual, the longer you bake, the harder they become so watch carefully so you get the cookie consistency you want. These were a hit and I had to hide the cookies in the picture so that I could photograph them. They lasted two days, even the ones I left in a little too long. They're easy so try them out when you're desiring some melty chocolate goodness and see if they really do live up to their reputation. After making pumpkin pie the other day, I still had about a cup of pumpkin leftover. I didn't want to waste it and was looking for a recipe that didn't call for a lot (of pumpkin) and was relatively easy. As luck would have it, Lauren from Stuffed. left a comment about the pie. 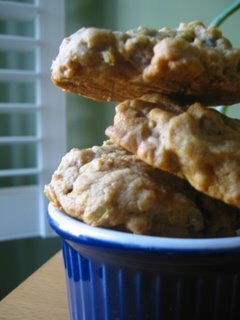 I visited her great blog and there I found a recipe for Pumpkin Oatmeal Raisin Cookies. The cookies were a simple drop cookie that could be mixed up in no time. Perfect! My reasons for making these cookies were about the same as Lauren's - I had all the ingredients on hand. The pumpkin made the cookies very flavourful - almost like eating pie. They were enjoyed very much in my house and are a fanstastic fall cookie. They bake up rounded and cakey with some chewiness from the raisins and crunchiness from the walnuts. I followed Lauren's suggestion and used large flake oats. This was a good move as smaller oats would have gotten lost in the dough. The large oats asserted themselves and held their own. All in all, they were good cookies and if I ever have leftover pumpkin, I'll make them again.